Over the years, both Tom and I were urged by friends and family members to go on a cruise. Neither of us was very interested in the idea. It sounded boring, spending days on a ship, cut off from the world (and the Internet! ), with nothing to do but sit in the sun (with my instant-burn skin? I don’t think so), get in a pool with a bunch of people we didn’t know (we have a pool and hot tub at home, so thanks but no, thanks), and be surrounded for a week by a bunch of drunken tourists while living in a tiny, cramped cabin pitching around in the waves somewhere out in the middle of the ocean. But people kept telling us it was fun, it was relaxing, it was the greatest way to travel. These weren’t flaky folks; they were people whose opinions we respected. Many of them said they’d felt the same way as we did before someone dragged them on a cruise, and then they ended up loving it. Could that many smart people be so completely wrong? Weirdly, I think it was the big “disaster” with the Carnival Triumph in February 2013 that got me seriously considering trying a cruise. When the ship had a fire that threw out the power and was adrift for several days without working toilet facilities, and media jumped all over that, trying to make the evil Carnival corporation the bad guy and bashing the cruise ship industry, my reaction was to start doing some research. And the best research involves first-hand experience. My cousins have been going on several cruises a year for the last several years. They had, from time to time, tried to persuade me to come along sometime. I think I surprised my cousin Sharon when one day I told her I thought I was ready to try it. Maybe you can teach an old dog new tricks. Tom and I had been talking about it for a while, since I had started looking into the industry and the idea of cruising. It was obvious to me, if you ran the numbers, that you could save a lot of money by traveling to other places that way instead of flying and paying for hotels and restaurants. I couldn’t help comparing what I’d spent on the trip to England and Scotland vs. the (almost) all-inclusive cost of a cruise. 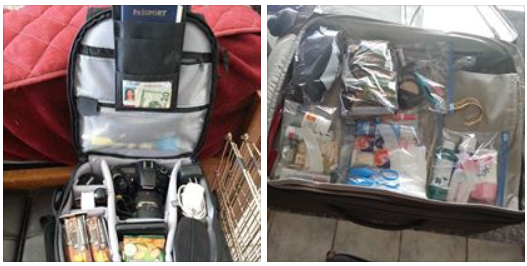 I’m a cheapskate, but I also have been bitten by the travel bug since the trip to Belgium and Denmark awakened something in me, so it looked like a way to see more of the world without spending a fortune. But Tom is less adventurous than I am, especially when it comes to bargains, so we’d agreed that I would be the guinea pig. I’d go on a cruise with Sharon and see how I liked it, and just as important, whether I thought it was something he would like. He’s never been very tolerant of hassle factor (although he’s getting better) so it made sense for me to go on the reconnaissance mission rather than risk subjecting him (and me) to a week of misery if he hated it. If I gave it a thumbs up, then he would venture out onto the high seas with me the next time. Sharon and I worked out a date that worked for both of us (early August) and a destination that seemed safe for a first-timer (Key West and Bahamas). I left the details of booking to her since she’d done it many times before. But since we booked a few months in advance, I had time to educate myself first, and I delved deeply into the subject of cruising. I read blogs and books and joined social media cruisers’ groups. I learned all the nifty little tips and tricks, from packing to quick debarkation. We were sailing Carnival because that’s the cruise line she had always used, and she had sailed so much she was almost to Platinum status (which at that time was achieved by taking ten cruises on the line). We wanted to sail out of Galveston so we could drive to port. 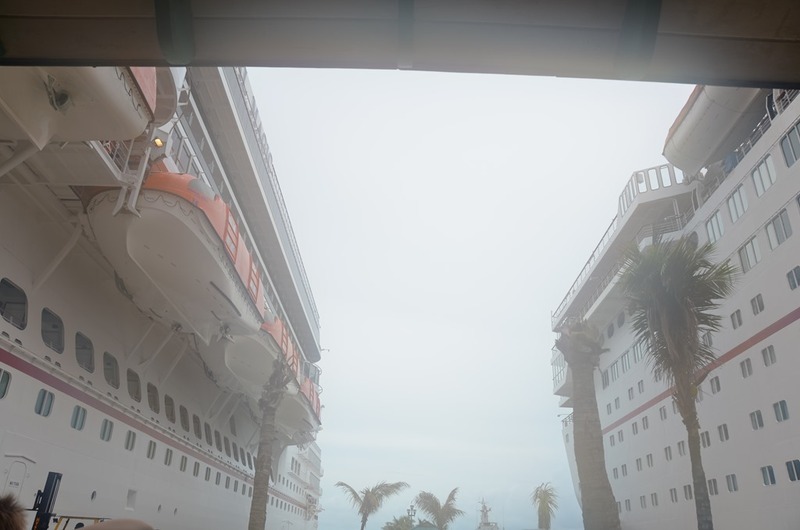 Carnival only has two ships ported in Galveston: the Triumph and the Magic. The Triumph sails shorter 4 and 5 day routes t o Cozumel, Mexico. The Magic has a wider choice of itineraries and does 7 day cruises to the eastern and southern Caribbean. Although it might have been logical to choose a short cruise for this Grand Experiment, I figured if I was in for a penny, I might as well be in for a pound. And I admit I wasn’t sure I wanted my first cruise to be on the media-christened “poop ship” – even though my logical side said it was probably one of the safest ships in the fleet now, having undergone $115 million in fixes and renovations after “the incident.” So now I was going to find out whether or not I should believe in Magic. After so many weeks of counting down the days (which Carnival conveniently does for you on its web site – a site with which I was intimately familiar by then), August 11th finally arrived. I had become a master at packing, so I was able to get everything in one large suitcase, an overnight bag that fits on top of it, and a carry-on backpack for all of my electronics (and that’s quite a feat, considering that I’m a bit OCD so I take everything I could possibly anticipate ever needing). 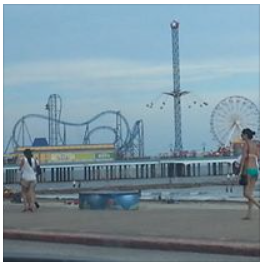 We actually drove down to Galveston the night before and stayed at a hotel that provided cruise parking and shuttle service. Since then, I’ve always driven down the morning of the cruise, but for the first time, I wanted to take no chances of something going wrong. Our room at the Country Inn and Suites was pricy (that varies a lot depending on the time of year and this was the “last hurrah” weekend before school started in many districts), but it was nice enough and the shuttle service was great. 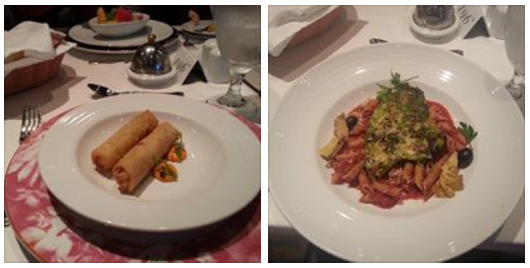 That night before the cruise, we had a lovely dinner at Landry’s Seafood on the seawall (Chilean sea bass and bananas foster – it doesn’t get much better than that, and I figured the ship’s dining room had its work cut out for it to compete). The place was packed but my Landry’s Select card got us a table immediately. Afterward, we walked along the seawall a bit, then turned in early, anticipating the big day ahead. That turned out to be a futile action on my part. I was too … excited/worried/curious to go to sleep. I finally dropped off around dawn and got a couple of hours before it was time to get up and head to the port. My first view of the ship up close and personal was eye-opening. I had no idea it was going to be that big. I guess I should have, since I knew her capacity was 4720 passengers and 1367 crew members (having memorized all the stats by that time). But actually seeing it was an awe-inspiring moment, one of many more to come. Things rarely go as smoothly as one would hope and this was no exception. Since Sharon didn’t yet have her Platinum status and we had booked a regular balcony room, not a suite, we were relegated to the regular line instead of the VIP check-in lounge (which I would get to experience on subsequent cruises and will describe in later blog posts). The line was short, though, so we were doing great – until, while we were at the check-in counter, all the computer systems went down. Really? I’m a tech guru and the computers all die on my first cruise. Was it an omen? We ended up having to go sit and wait for over an hour; this was not giving me a wonderful impression of the “relaxing and fun” nature of cruising. Finally they started boarding people even though the problem wasn’t completely fixed. 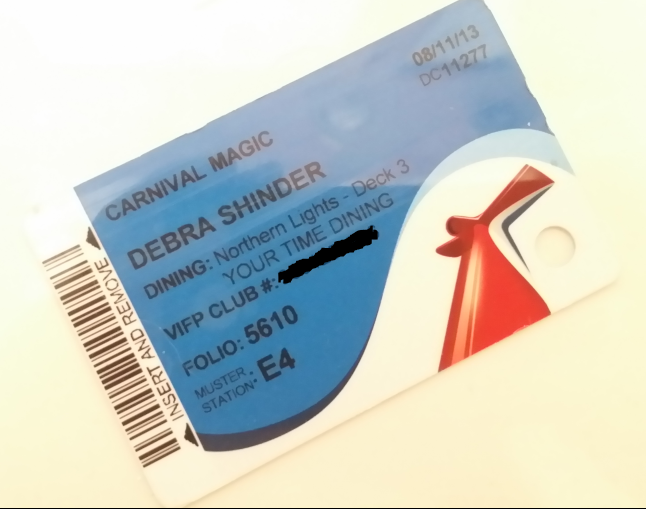 After that minor glitch, we got our Sail & Sign cards (which serve as your onboard payment method and cabin door key) and we set off to find our cabin on deck 7. I didn’t know then that the blue card would become the first of an ever-growing collection. When we got to our balcony room, I was pleasantly surprised. The cabin was bigger than I had expected, though by no means huge. The big window and balcony made it s eem bigger than it was. The bathroom was tiny, but functional. The sink counter was wide and there were lots of shelves for storing toiletries and such. They did a good job of making the most of the compact space. I wasn’t sure how Tom would do in such a small area, but it was fine for us two ladies. Our bags were already there (we had purchased the Faster to the Fun – FTTF or F2F – package that, for $50 per cabin extra, gives you priority boarding (the reason we were among the first on the ship) and guarantees your room will be ready and your bags delivered when you board (although as I found out on later cruises, that guarantee doesn’t always hold true). We unpacked and the empty suitcases easily fit under the beds, and there was plenty of closet space with rods and shelves for our clothes. I was glad I’d read the tip about packing extra hangers, as there definitely weren’t enough. Once we got everything put away, it was time to go get some lunch and explore the ship. I was still uncertain about whether I was going to like this or not, but I was ready to start finding out. First up was that 24 hour ice cream and yogurt station I’d h eard so much about. Yes, it really is as good as they say – at least for someone who, like me, grew up loving Dairy Queen. Cold, creamy desserts always lift my spirits, so I started feeling a little more optimistic about the whole experience. Then we hit the buffet, where I found to my relief that there were plenty of healthy choices along with the caloric-laden ones. I had been worried about that. I grabbed some grilled chicken, some fish, and a bunch of fruits and veggies. My first impression of the food was definitely positive. Next, we walked around to familiarize ourselves with where everything was on the ship. It was especially nice because we were among the first ones to board and the systems went down again right after we got on, so all the rest were delayed. We and a handful of others had the place to ourselves. I took lots of photos and – since we were still docked in Galveston with a good 4G connection – uploaded them to Facebook so Tom (and many friends back home and across the country who were living this vicariously through me) could see where I was going to be spending my time for the next several days. 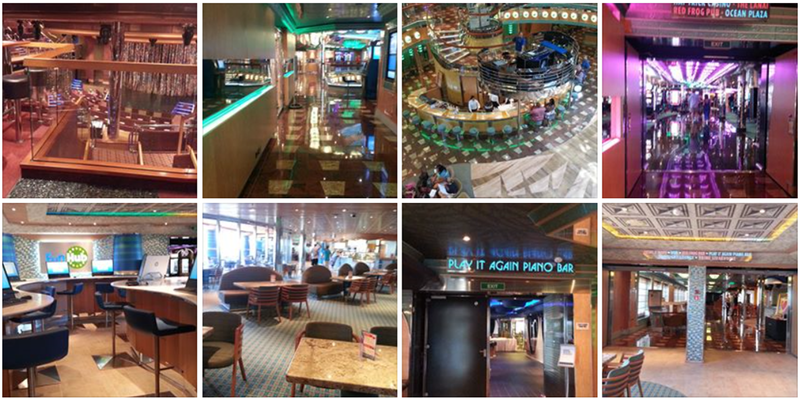 We checked out the theater, the lounges and bars, the Internet café (more later about onboard Internet connectivity), casino, shops, lobbies, dining rooms, steak house and other public areas. Of course, the shops and casino were closed because we were still in port but the bars were open – although neither of us was into drinking that early in the day. There were obviously plenty of others who had no such compunction. 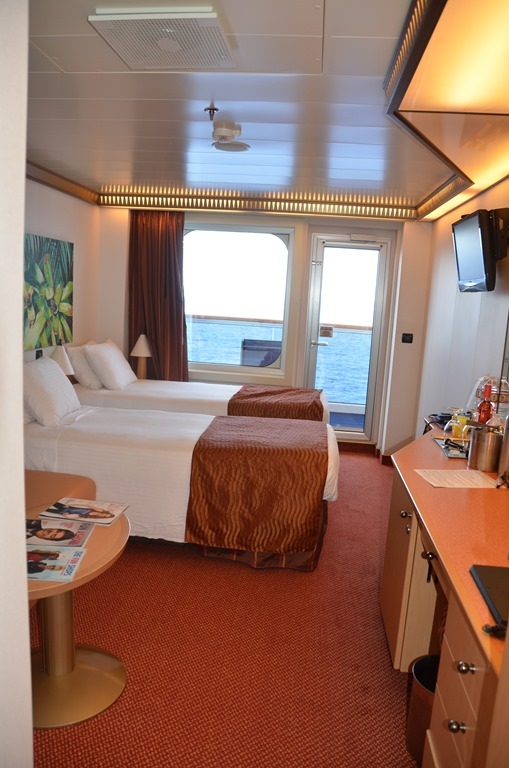 I was thrilled to see that they had a very nice gym – and it was on a top deck at the very front of the ship, so the view while on the treadmills, bikes and ellipticals was going to be fantastic. Yes, I know I’m atypical, but this was a big plus for me. Next we went outside and walked around the decks, checking out the pools and hot tubs and lounging spots. I’m not a sun worshipper but I do love to walk for exercise, and I was happy to discover that you could walk all the way around and around the ship on deck 5. I knew that was going to be an important part of my daily routine for the next week. Well, okay, not exactly. But finally, the rest of the passengers boarded and it was time for the muster drill (not “mustard drill,” as I heard it called by more than one fellow cruiser). Our station was in the aft dining room, where a large group gathered to see a demonstration of how to don your life jacket (which are in each cabin) and find out about the lifeboats and emergency safety rules. This is mandated by international maritime laws and all 4000+ passengers must attend. It took about 45 minutes but seemed much longer as we were first there and had to wait for others. It was hot, and I was uncomfortable and sweaty and thinking maybe I just wanted to go home now. I was imagining Tom getting impatient and irritated as he sat through this, and being grumpy the rest of the night as a result. This was probably the low point of the cruise for me. Dinner times had been delayed because of the computer system problem, as was our departure from port. We had been scheduled to leave at 4:00 pm but didn’t start moving until around 6:00 pm. We were hungry and ready for dinner, and we had selected the “your time dining” (YTD) instead of a set dinner time, so we made our way to the Northern Lights dining room in the middle of the ship. By this time, I was dragging. Remember that I’d only had two hours of sleep the night before. Thus, I didn’t fully enjoy that first dinner as I might have otherwise. The food was good, but the service wasn’t great. The waiters seemed overly stressed (no doubt because of the late departure and the way all the schedules had been thrown off) and weren’t very prompt about refilling water glasses and coffee and such. It was crowded and our table was out in the middle of the room, with people passing by – close by – all the time. I had veggie spring rolls and something called chicken la greque, which was actually quite yummy. My hunger was satisfied but I wasn’t impressed yet. We didn’t do much after dinner that first night, though we did walk around and peek into some of the clubs. We went to the steak house and made reservations to eat there the last night of the cruise. I’d heard it was really elegant and was hoping for a better (i.e. quieter and calmer) experience than I’d had in the main dining room (MDR) that evening. I didn’t realize then that the first night in the MDR is usually a bit chaotic and not representative of how it will be for the rest of the cruise – and this time it was further complicated by the computer problems that had thrown everything into disarray. I got back to the cabin and wanted to check in with Tom and my Facebook friends before bedtime. 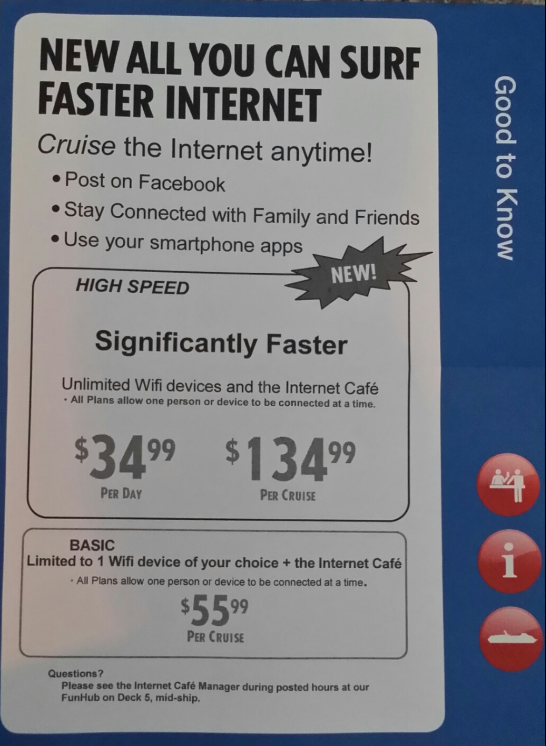 I had gotten excited when I found out the Magic was one of the only ships in the fleet that offered a “high speed” unlimited access Internet package for $139 for the week. I signed up for it as soon as I got onboard. Unfortunately, the problems affecting the ship’s computer systems apparently extended to the local network. I couldn’t get online, or when I did, was dropped after a minute or two. I wasn’t able to get a message through to Tom or find out what was going on at home. I wanted to cry in frustration. There was a bright spot, though. When we got back to the cabin that evening, I had to smile when I saw what our cabin steward had left. 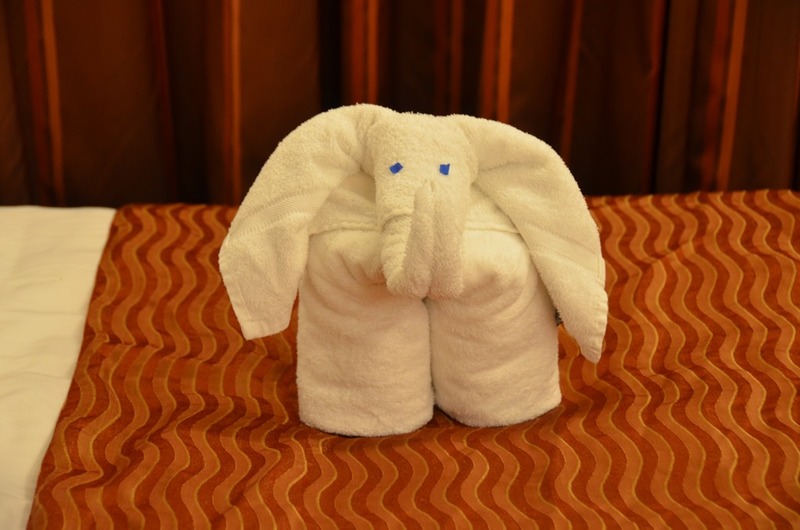 One of the infamous towel animals, a practice with which I would become intimately familiar over the next week. I still wasn’t “feeling the love” for cruising at that point, but since we were now out at sea and I was stuck there for the week, I gave up and went to sleep. I figured I can stand anything for a week, and I was already trying to figure out how to tell Tom that this grand experiment was a colossal failure and I didn’t think we’d be going on any cruises together in the near future. But oh, what a difference a day (and a good night’s sleep) can make. Stay tuned for my next post on how drastically my attitude changed, beginning the next morning.